At last I found a place where I can write without being read. Leaving aside the blackboard, that is. Just inaugurated my own public and overexposed blog no one should be interested in peeking at. I wonder why I felt like starting in English. The thought that I might be forgetting my roots and betraying my culture haunts me day and night. I guess the impulse had something to do with the fact that I’m working on a book in English, which forces me to spend an average 12 hours a day trying not just to write but to think in this language. Translation from my more elastic, sentimental, communist mother tongue is something I forbade myself many years ago. It just doesn’t work. You begin by placing an occasional subject after the verb and it all will end up sounding like Amada en el amado transformada or some other God-inspired line. The situation is further complicated by the fact that I just finished reading a novel in French – no big deal, but it was signed by its author – and during these last days I’ve sometimes found myself thinking basically incoherent things such as Dépêche-toi or Je m’en doute. Hey, I think I’ve even learned to use the passé simple, this most useless of all verbal tenses. Il y eut beaucoup de gens qui ne l’utilisèrent jamais. De toute façon, when writing entries for this blog, under no circumstance am I to use online translators or dictionaries in order to mask my expectable gramatical mistakes as well as my notorious lexical poverty. This is actually me, not my academic self. 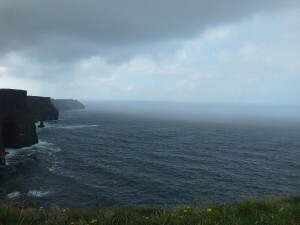 The sky is above, Moher cliffs are below.